Deer are beautiful creatures. A family of deer prancing across your yard is an event worthy of gathering the kids for an encounter with nature. While there may be a sense of wonder attached to the fact that such large animals live so close to humans – this situation does not bode well for your landscaping. A century of suburbanization has rid deer of most natural predators causing their populations to soar. 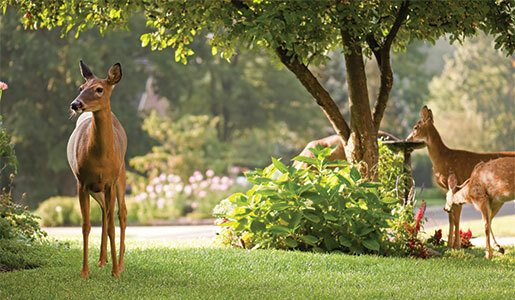 Suburbanization has also provided deer with a convenient food source – pretty much anything you are trying to grow in your yard! Limiting plant loss from deer is a challenging proposition. Once upon a time, bags of human hair hung from trees drove them off. This was in a bygone era when deer feared humans. These days, fragrant soaps hung in mesh bags can help ward off the deer. Commercial repellants also exist, but be sure to research which one is best for you. Some repellants can damage food plants, and most will need to be re-applied after heavy watering or heavy rain. Some plants such as black-eyed Susans, daffodils, and lavender are unattractive to deer and can be planted throughout your yard. Unfortunately, the most effective way to secure your plants against deer damage is a physical boundary of some kind. Netting or chicken wire around (and on top of) your garden plants will often do the trick. Fences around your yard will also help (although deer are VERY good jumpers). These barriers may be unsightly, but often they are the only solution to a serious deer problem. The best way to gauge your situation is to try several solutions to see what will work. Not all deer are repelled by the same things, and some populations are more tame than others. Trial and error is your best bet in keeping your plants from becoming a deer buffet. The National Association of Landscape Professionals (NALP) is pleased to announce the addition of MARTIN LANDSCAPE, INC. as a participant in the NALP Safe Company Program, sponsored by CNA Business Insurance. The Safe Company Program is a new safety initiative developed by the NALP to assist landscape and lawn care companies in their efforts to provide a safe work environment.